Abbey Lincoln and Max Roach were married in 1962, an association that lasted until 1970. They worked together for a while but Lincoln (who found it harder to get work in jazz due to the political nature of some of her music) became involved in acting and did not record as a leader during 1962-1972. She finally recorded for Inner City in 1973 and gradually became more active in jazz. Her two Billie Holiday tribute albums for Enja (1987) showed listeners that the singer was still in her prime and she has recorded several excellent sets for Verve in the 1990s. 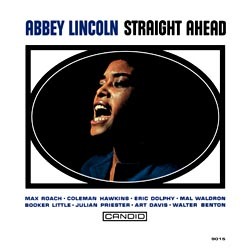 Because she puts so much thought into each of her recordings, it is not an understatement to say that every Abbey Lincoln set is well worth owning.